If you’re like me, you might find the men in your life a little tricky to shop for. So, to suddenly have a whole gaggle of fellows — like your groomsmen — to get gifts for, your shopping tasks can seem even more daunting. For my own wedding, we gave the groomsmen ties, which is a fairly common practice, However, as I think about it more, it would have also been nice to give another gift that wasn’t completely just about their prescribed wedding attire. Some of these gifts can definitely be worn on the day of the wedding, but also have some personalization that will make them a treasured gift for years to come! In particular, I love monogrammed socks which were at Etsy find. You can go beyond just personalized initials and go crazy with prints, and patterns like these from CraftyMomma designs on Etsy. While we’re on the topic of footwear, I also love these colorful shoelaces, which I received a sample of to review from Whiskers Laces. They are so cute in person! They are great way to add a bit of whimsy in and color to lace up your standard dress shoes. These colorful patterns makes for a great opportunity for a shoe detail photo with your groom and groomsmen. And, these aren’t just limited to wedding wear; your groomsmen can use them again on other pairs of shoes they own. You can pick from so many styles to match your wedding colors, your school colors, or laces that just go with your outfit. I’m particularly smitten with the navy blue and white striped pair for a nautical wedding look. 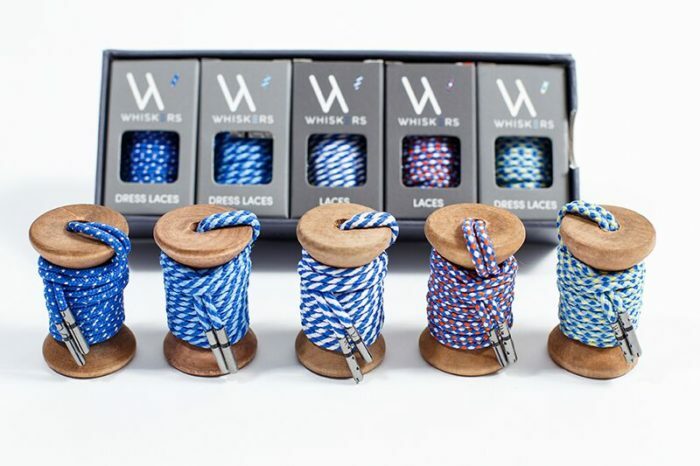 A set of laces from Whiskers Laces. You can work a bit of personalization into everything if you try. Mark + Graham, the company that makes the keyfobs and card holders seen int he collage above specializes in personalized gifts. 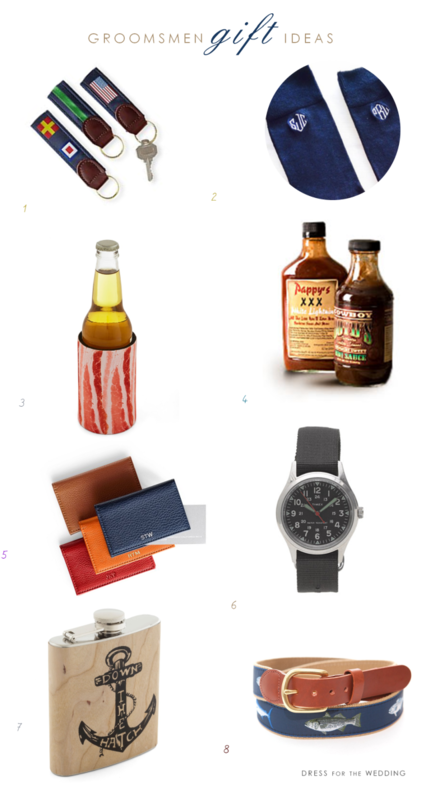 I hope these suggestions give you some ideas of what you’d like to give to your groomsmen; and you might have noticed that these would all make fun gifts for Father’s Day if you’re on that gift-giving search right now. Happy giving! Also see our posts with ideas for engagement gifts, gifts for bridesmaids, personalized gifts, and gifts for the mother of the bride or groom, for gift ideas for your everyone in your wedding party! These are great. My husband would love any of them! Great ideas! Love the flask. The flask is a great find! I also love the idea of gifting personalized items that the groomsmen can appreciate for years to come!